Iconic restaurant Limor’s International Steak House was on fire. The 30 year old dumbwaiter needed to be removed and a new unit supplied and fitted to withstand the demands of a commercial environment in 6 weeks. A Caulfield steak house has been extensively damaged by fire. MFB received numerous calls to attend a blaze at Limor’s Restaurant in Kooyong Road, Caulfield North, about 7:36am. On arrival, firefighters were confronted with a fire in a two storey brick building measuring 30x15 metres. The 30 year old dumbwaiter needed to be removed and a new unit supplied and fitted to withstand the demands of a commercial environment. (A 6 week period to completion was required). The solution…. the Premium Series (DW4000-100), 2 level dumbwaiter. This unit is designed to cater for constant heavy work with a large volume stainless steel lined lift car and a huge 100kg capacity. The lift car was fitted with dual shelves, the front opening used to access the kitchen area on the ground floor and the dining area on the first floor. This commercial application required a brand new unit be built and fitted with the 6 week time frame allowed to complete the fire damaged rebuild. 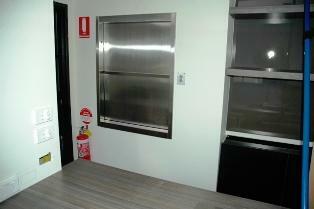 The dumbwaiter has become a vital tool for the staff. It quietly and reliably performs a variety of transportation tasks. It has eliminated the hazardous task of carrying heavy goods and meals upstairs to the dining area.